They say that a week is a long time in politics. Unfortunately the opposite appears to be the case in the Dublin licensed trade as a pub of 100 years standing is not generally considered a particularly old premises. Perhaps this is because we have so many old premises or, perhaps it is that we do not properly appreciate the richness of culture and social history that is attached to our industry. At Harry Byrne's we have always been conscious of our great heritage, and we are very proud of the fact that 1998 marked our bi-centenary. We are fortunate that we have been able to trace our history back to its humble origins as a Coaching Inn in 1798. Along the way our industry has seen great innovations, and our country has witnessed great changes. Now, as in ages past, though perhaps not as important historically, the pub remains central to the Irish way of life. We at Harry Byrne's have a unique history and a unique heritage. We take comfort in the fact that we have always been faithful to the ethos of the traditional pub despite the obvious temptations, over the years, to modernise. To have done so would have been an act of cultural sabotage resulting in the desecration of a Heritage' pub. 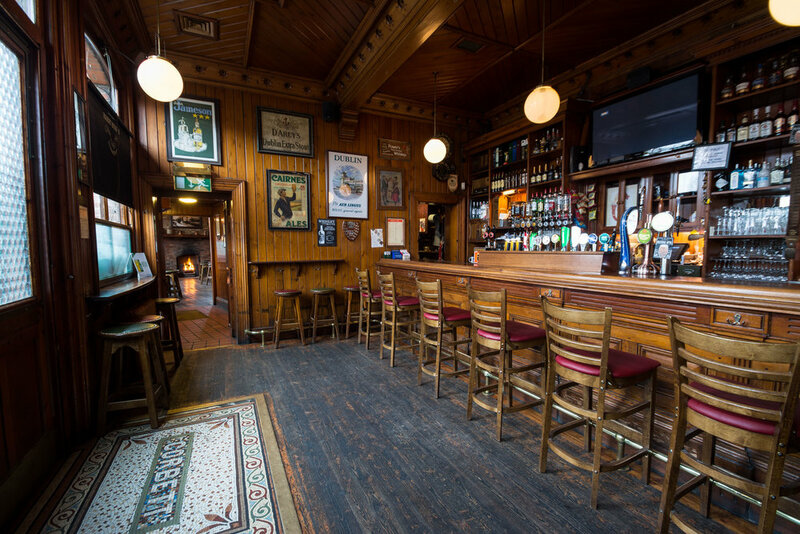 This gem of antiquity, which is descended from an 18th century Coaching Inn, opened its doors to the Dublin public in 1798. The first licensee, David Hallisey, acquired this site as a consequence of the unsafe travelling conditions on the Howth Road, `which enjoyed a notorious reputation for the four miles that it disappears from the shore at Clontarf until it reappears again beyond Raheny. The opening of Annesley Bridge at Fairview in 1797 gave an added importance to the North Coast bringing with it increased coach and merchant travel. Along the way they had to contend with Mud Island, a vile and despicable area between the present Ballybough Road and the North Strand, which was an infamous resort of smugglers, thieves and murderers. And if the traveller of the age survived this, he next came in contact with the `Sloblands' - the present Fairview Park - which harboured all sorts of vagabonds, society cast offs, common thieves and miscreants, who thought little of relieving vulnerable passers-by of life and limb, not to mention his worldly goods. Further along the Howth Road in close proximity to the Black Quarry and the Hollybrook River, our 18th century coach traveller encountered the more professional highwayman - normally on horseback - who excelled in the art of robbery, but seldom killed or maimed his victim as such outrages brought swift recriminations from the authorities, the consequences of which impaired the smooth and efficient operations of the highwayman's profession. These were the prevailing social and economic conditions which David Hallisey encountered when he acquired the first licence here in 1798. Little documentary or solid historical information is available to us of the social conditions of the early Coaching Inn. However, we know that the Inn had a solid perimeter fence and a large coachyard which has survived as part of the modern day car park. The premises itself is thought to have been a modest two storey thatched dwelling which would have accommodated up to 10 - 12 travellers at any given time. The water supply of the Inn was provided by a deep natural well which is now a feature of the premises. The Inn would also have contained a blacksmith's forge and livery stables where the horses were tended and rested, or exchanged for the next stage of the journey. In those days the Inn was rarely if ever frequented by local inhabitants, and would have relied solely for its existence on the business of coach travel. The beverages consumed at the Inns of this era were invariably home brewed Ales, Brandy, Port and Wine. In 1809 Howth was constituted as the Mail Packet Station, an event which brought increased activity and commerce to this area. 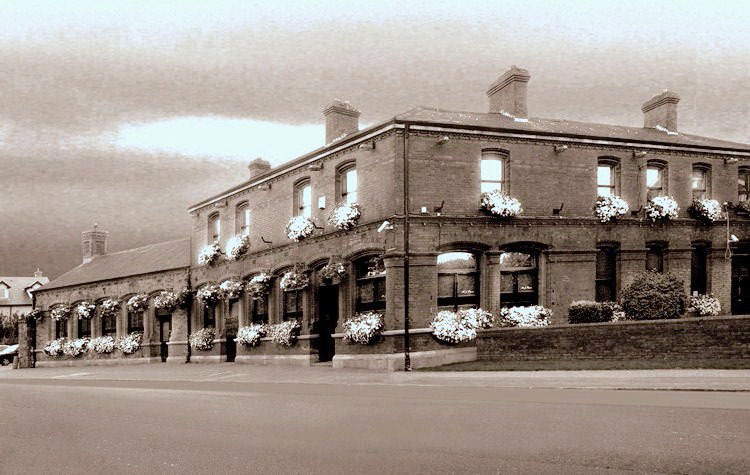 This Inn along with another Inn in Raheny Village were designated as mail despatch depots on the route to the City of Dublin. Each day the Royal Mail Carriage would stop here to collect and deliver the mail for this hinterland. This gave the Inn a status of increased importance among the Ascendancy classes - but it was of short duration as faster roads, better communications and a decrease in criminal activities dictated that the Inns were no longer necessary as mail despatch depots along the route. From this point onwards the role of the Inn went into swift decline leaving several gaps in the licensing records. The 1835 Commission into the operations of the licensed trade in Ireland made a scathing attack on how some premises, including this one, were run, describing them as 'being highly injurious to the morality of the lower orders'. About this time, a prominent local farming family, the Carolans, acquired the premises and began the task of adapting the old Inn to the constraints of a new age that was tempered by stricter licensing laws and the emergence of the great National Temperance Campaign of Fr. Theobald Mathew. By 1861 Thomas Carolan was running a small pub and grocery business here in addition to the local family farm. By 1874 his son Patrick had taken the reins as by now the family had acquired two other pubs in the area -the present day 'Yacht' in Clontarf and a premises in Fairview which is now defunct. At this time the premises acquired a 6am opening licence to accommodate farmers, market gardeners and cattle drovers en route to the Dublin markets. a rebuilding programme which was not completed until 1907. That renovation is essentially what you see before you today —unspoilt and untainted for over one hundred years. was Harry Byrne. When the young Harry arrived here, Clontarf was a quiet, sparsely populated suburb of the City of Dublin. Under the vigilant and inspirational eye of James Corbett, he quickly learned the rudiments of the Dublin trade. During these years of the infant Irish State his only sensational experience occurred when the premises was one morning subjected to armed robbery. Later, following the custom of the trade, he moved on to gain further experience in another pub, scarcely realising that he would ever return to Clontarf. But in 1947 he did just that, returning to buy this premises at the then astronomical price of £22,000 - a development which sent ripples and shudders through the conventional Dublin trade. And so the citizens of Dublin have over the past 50 years come to pay homage to this great heritage pub that bears the name of Harry Byrne. Harry remained in the family business until the 1970s, earning the reputation of a strict, austere yet compassionate publican who always cared for the welfare of his customers. So much so that he sometimes sent home even his best customers if he considered that they had exceeded their quota.